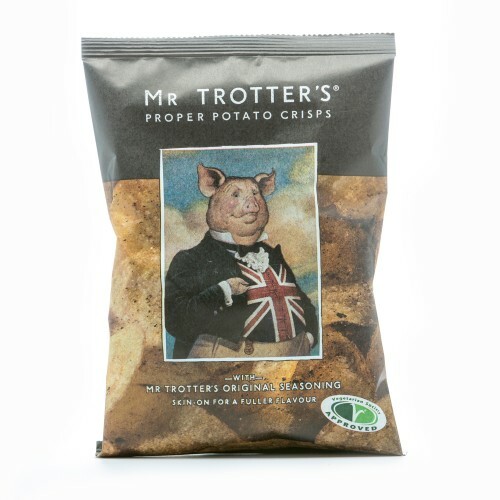 Mr Trotter's is primarily a pork scratchings company. The venture into Crisps is a little skewed by translation when considering the packaging. The well dressed pig is perhaps a little synonymous with the owners of the company (one of which, Tom, is the son of Camilla Parker Bowles). The Crisps in the background and the image on the front is a little grainy, like an underexposed photograph. It doesn't mention a flavour, but it does say that the Crisps are seasoned with Mr Trotter's Original Seasoning, whatever that might be. The effect is aesthetically pleasing, but it doesn't really do its job efficiently. The first bite was the same as the last. While the Crisps were not snappy crispy, they did have a firm and cracker like crunch that sustained throughout the munch process. These were very thickly sliced Crisps with bundles of character for what were, after all, regular Crisps. The darkened yellow colouring was added to by even darker oil patches and a brownish coloured seasoning. There was also plenty of skin on edges. A Nose Plunge Test revealed a rather odd smell of roast dinner tins left to soak in a washing bowl. The flavour was equally odd, but pretty much what it said it was on the packet. A sort of pork crackling taste that we haven't come across before. It was certainly a greasy pork scratchings kind of flavour that had a love it or hate it appeal for taste test team.